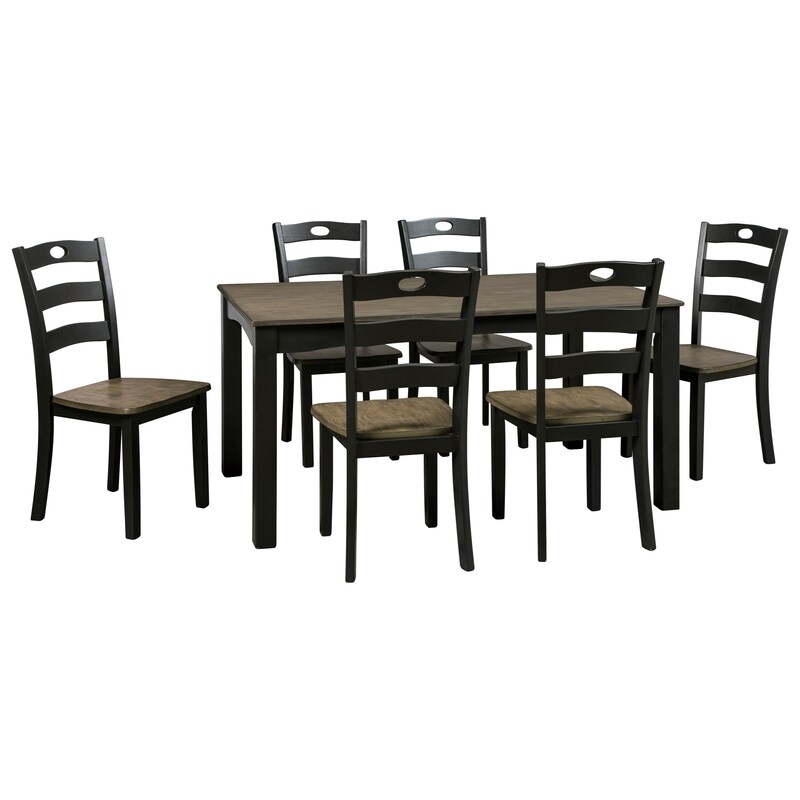 Update your dining space with this seven-piece dining room table set. The black finish contrasts with a brownish gray finish for the table top and chair seats. The arched table aprons on the table add more leg room at the table. The chairs ladder backs have a pierced detail on the top rail and contoured seats to provide comfort during meals. The Froshburg Two-Tone Finish 7-Piece Dining Room Table Set by Signature Design by Ashley at Sam Levitz Furniture in the Tucson, Oro Valley, Marana, Vail, and Green Valley, AZ area. Product availability may vary. Contact us for the most current availability on this product. Side Chair Info Seat width 18.00" Seat depth 15.75" Seat height 17.75"
The Froshburg collection is a great option if you are looking for Contemporary Cottage furniture in the Tucson, Oro Valley, Marana, Vail, and Green Valley, AZ area. Browse other items in the Froshburg collection from Sam Levitz Furniture in the Tucson, Oro Valley, Marana, Vail, and Green Valley, AZ area.